After dipping slightly in 2013, annual earnings of the top 1.0 percent of wages earners grew 4.9 percent in 2014, and the top 0.1 percent’s earnings grew 8.9 percent, according to our analysis of the latest Social Security Administration wage data. This analysis provides the first look at the likely trend of the household incomes of the top 1.0 percent. The top 1.0 percent’s earnings have nearly returned to their previous high point, attained in 2007. In fact, the earnings of workers between the 99th and 99.9th percentiles have reached their highest level of all time—it’s only the earnings of the top 0.1 percent that are still below 2007 levels. The top 5.0 percent has also reached its highest level of earnings ever. Surprisingly, wages of the top 1.0 percent declined in 2013, while those of the bottom 99.0 percent grew. We hypothesized that this decline in top earnings might reflect income shifting, as a new, higher top bracket—39.6 percent—and an additional 0.9 percent Medicare tax on high earners provided incentives to shift compensation into 2012 (when top 1.0 percent wages grew 6.1 percent). It looks like we were right. The strong growth of earnings at the top in 2014 suggests that the highest earners have found their mojo once again. In the analysis below we review these recent trends, as well as trends during the Great Recession and over the longer-term. 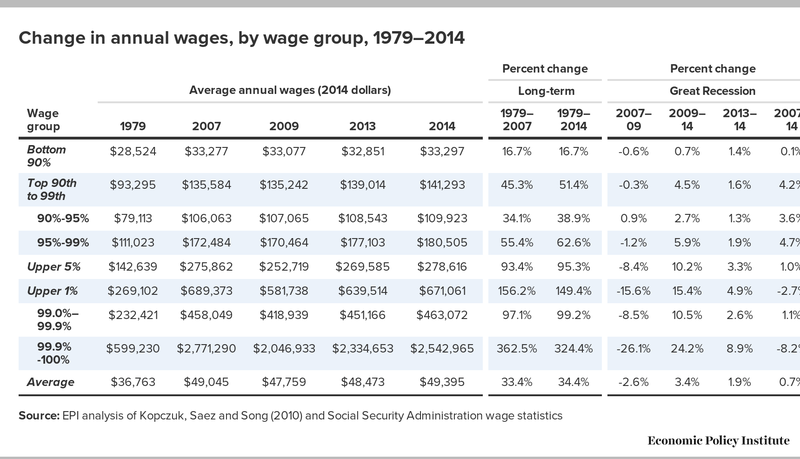 The table below shows that annual earnings for the bottom 90 percent of earners rose 1.4 percent in 2014, to $33,297—just $20 above their 2007 level. Given that hourly wages were stagnant or falling throughout the wage scale in 2014, this growth in annual wages must have been due to an increase in hours worked per worker. Workers between the 90th and 95th percentiles of wages (averaging about $110,000 in 2014) saw wage growth comparable to that of the bottom 90 percent (1.3 percent) and the earnings of workers between the 95th and 99th percentile grew 1.9 percent. Among the 1.0 percent, earnings for the top 0.1 percent grew the strongest (8.9 percent), while those just beneath them—the next 0.9 percent—had a slower 2.6 percent earnings growth. Wage levels for everyone except the top 0.1 percent have returned to where they were before the Great Recession in 2007. Those in the bottom 90 percent, as discussed above, earned just $20 more in 2014 than in 2007—essentially stagnant growth over the last seven years. Those just above, in the 90 to 95th percentiles earned 3.6 percent more in 2014 than in 2007, while those in the 95th to 99th percentiles earned 4.7 percent more. The wages of the top 1.0 percent took the biggest fall in the 2007-09 downturn and therefore have had the most ground to regain.. Because the top 0.1 percent earned 8.2 percent less than their 2007 levels, the top 1.0 percent were still 2.7 percent below 2007 in 2014. Both the top 5.0 percent as a whole and the 99.0 to 99.9th percentiles achieved higher earnings in 2014 than in 2007 and, as mentioned above, now have their highest earnings levels ever. As you can see in the figure above, the longer-term trends show tremendous disparity in wage growth. Wages of the top 1.0 percent rose 149.4 percent from 1979 to 2014, while the top 0.1 percent—the very highest earners—had earnings grow at least twice as quickly, up 324.4 percent since 1979. 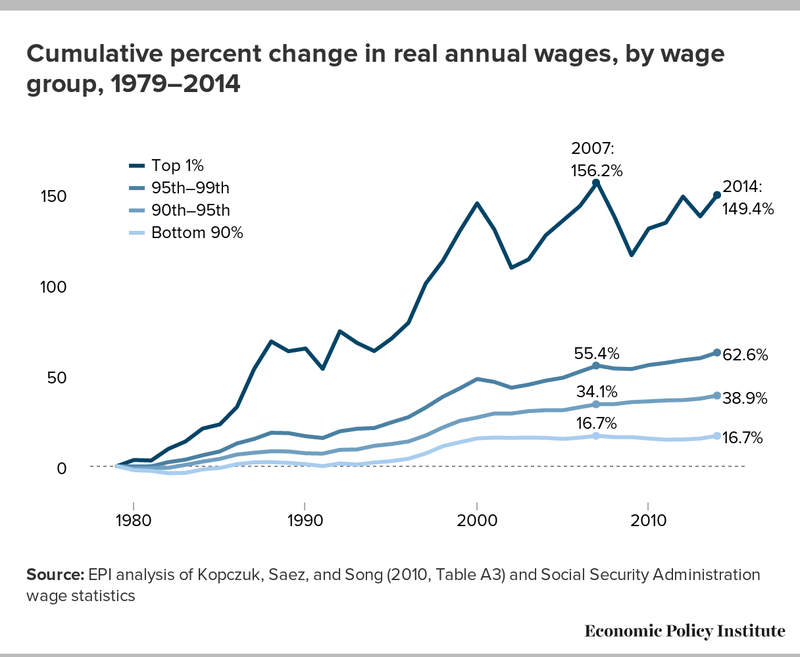 Higher wage earners below the top 1.0 percent saw their wages grow between 38.9 percent (90th to 95th percentiles) and 62.6 percent (95th to 99th percentiles) from 1979 to 2014. Productivity (net of depreciation) grew 62.7 percent from 1979 to 2014 so the only groups whose wages matched that growth were the top 1.0 and top 0.1 percent. The annual earnings of the bottom 90 percent rose just 16.7 percent from 1979 to 2014, but grew by only 1.0 percent since broad-based earnings stagnation began in 2002. In contrast, the wages of the top 1.0 percent grew 19.2 percent from 2002 until 2014.